My supervisor at the orchard called yesterday to ask me to work this weekend. I said yes. We’ll be selling blueberries from Michigan for a few hours on Saturday and we’ll discuss plans for the upcoming season. It is my earliest start in six seasons. It’s also a sign the year is on the back slope. Fall will soon arrive. Being home more has helped make the garden our best ever. Just an hour a day after planting has been enough time. 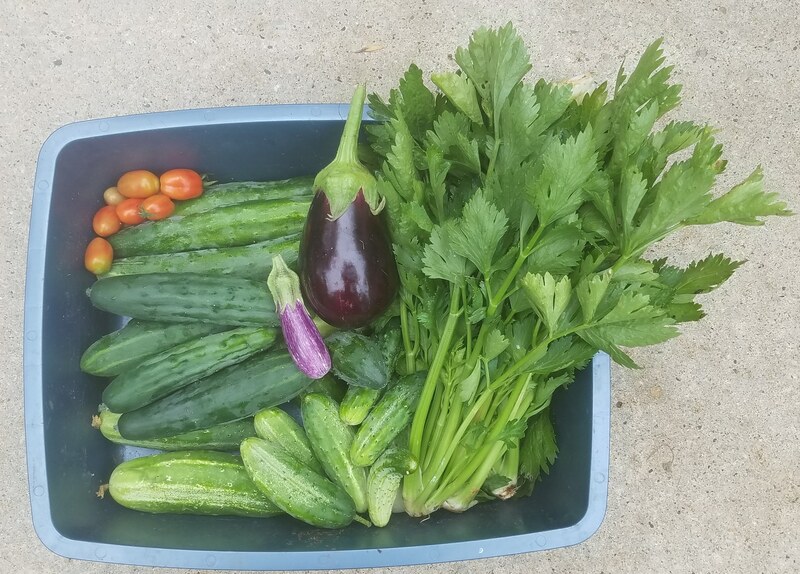 Some of the new techniques: using composted chicken manure for fertilizer, mulching pepper and cucumber plants immediately after planting, using a fence to grow cucumbers, and putting a deer fence around the tomatoes have facilitated Mother Nature’s growth. I still haven’t had to buy a single onion or head of garlic at the store this year. We are eating something fresh from the garden daily. I’m used to having events to which to look forward. That means I’m not used to the five-day weekends semi-retirement and completion of spring farm work brought this July. I’ve been doing a lot of resting in between activities. I’ve made a conscious effort to reduce the number of activities. So resting outranks doing for the time being. Based on more than 50 years in the workforce, I’m used to a scheduled shift being the focal point of each day. In retirement, that changes and will take accommodation.The idea is not to replace work shifts with other, different kinds of events. Rather focus on awareness of tasks being required and doing them as needs rise to the surface of our new lives together. For example, I planted 48 celery plants. Yesterday I harvested five to see how they were growing. I trimmed the heads of bad stalks and used what was salvageable in a stir fry for lunch. The five cores, or what grocery stores call “hearts” I bagged and refrigerated for later. What I learned was celery is about ready for harvest and that means a big project of cleaning, trimming, slicing and freezing for winter use in soup and stir fry. That task is lingering and will rise up soon. The point of retirement is to perform tasks like this in time, but when fancy deems best. It would be a waste not to get this done, but I’m reluctant to write it on my calendar. I’d rather wait for the right intersection of seasonable temperatures, personal energy and peak vegetable readiness. That time will reveal itself outside the unforgiving tyranny of a calendar. Even the milkweed plants are doing well this year. I did little other than weed around them and cut away the vines wanting to grow up the stem. 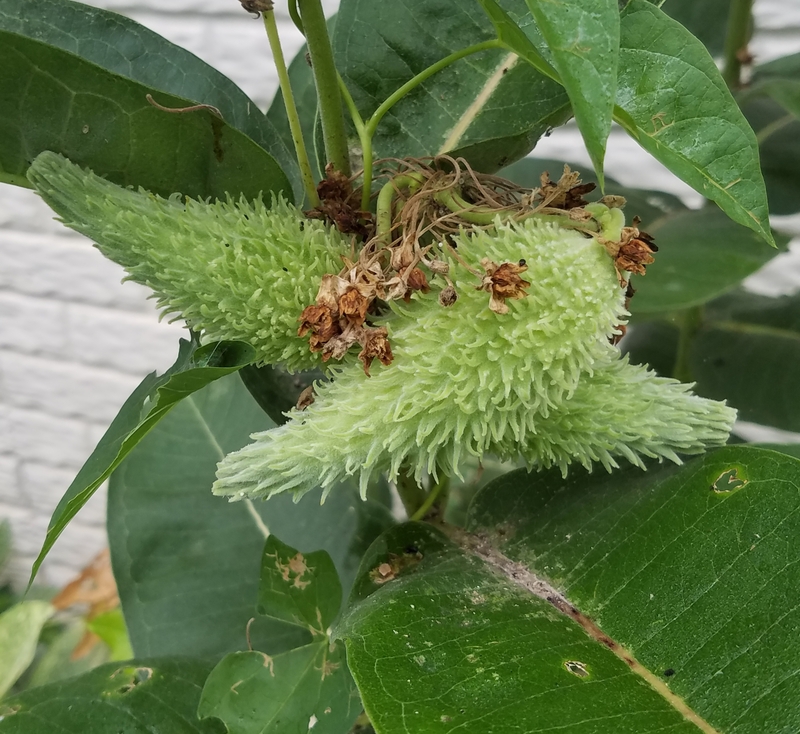 Several plants are forming seed pods. I’ll learn a little bit about them and harvest the seeds to grow more in a different spot. Someday I hope to see a butterfly caterpillar on one of them. It looks like as I’m writing the presser in Helsinki, Finland with Vladimir Putin and Donald Trump is about to begin. A reporter claiming to be from The Nation has been forcibly removed. Neither leader is a fan of a free press, although both use it to their advantage when they can. We also know about the many journalists who “disappeared” under Putin. I’d rather look at butterflies than think about U.S. – Russian relations. It’s hard to avoid, just like it’s hard to stop thinking about my next work shift. If we’re to change habits, we have to work at it. That may be why I continue to write these posts, work at the orchard, and at the home, farm and auto supply store… for now. My life would be worse without it. This entry was posted in Home Life, Writing and tagged #amwriting, homelife, summer, sustainability, Writing. Bookmark the permalink. Seems like summer just started!